This collection, funded by the Andrew W. Mellon Foundation, will be a digital repository of over 120,000 pages of material available online. The project centers on merchant vessels of the nineteenth century, the people who owned and sailed them, and the records pertaining to them. Merchant ships were the backbone of the American economy and culture through the nineteenth century. They carried supplies, building materials, trade goods, and luxury items to and from ports throughout the country and the globe, and they brought millions of immigrants to this country. America’s contact with the rest of the world, prior to transoceanic cable, was primarily maintained via the merchant marine. Merchant traders established cities, opened frontiers, negotiated alliances, and distributed ideas, culture, and technology. Given the merchant marine’s important role, it is not surprising that the majority of the Museum’s research requests relate to merchant vessels in some way, and involve the use of such specialized materials as ship registers, ships’ plans, and archival collections. Of these, the ship registers are the most heavily utilized by our staff and the public. Produced for shipping companies and insurance firms, merchant ship registers document vessels’ names, size, captains’ and owners’ names, home ports, type, date and place of construction, materials used in building, and other vital information needed in studying their history. In many cases, these registers represent the only record of a particular vessel’s existence. Of the literally tens of thousands of American vessels which once plied our waterways, only a tiny number have survived, most having been broken up or otherwise lost to history when they reached the end of their useful life. Their builders, many of them anonymous, have died or gone out of business, and their models and plans, if any existed, have disappeared as well. Much of the research done at the G.W. Blunt White Library and other maritime research libraries involves ship genealogy: verification of a ship’s identity and some salient facts about it. As a consequence, most books and articles written on maritime subjects (nautical archaeology, shipbuilding, marine commerce, etc.) cite ship registers, such as Lloyd’s Register of Ships or the Record of the American Bureau of Shipping, to verify the facts about the ships involved. While no book or article is based solely on the registers of ships, the registers hold critical information that simply cannot be found elsewhere, and which in turn unlocks other sources, such as logbooks, manuscripts, ships’ plans, maps and charts, and photographs and paintings. Aside from their usefulness in scholarly and artistic endeavors, ship registers are currently in great demand because of the growing interest that the general public is showing in the research of personal family history. Prior to the mid-twentieth century, the only way that emigrants from most countries could make their way to America was by ship. As people delve into their past, they not only want to know from where their ancestors came, but how they eventually reached their destination. Once a person determines the identity of the vessel that brought their ancestors to this country, we can tell him something about it. Published ship registers are always a critical piece in establishing the identity of the vessel being researched. Once this information is known, the researcher can begin exploring primary and secondary sources associated with the vessel in question. The information in the registers, in fact, helps to “link” a vessel to other primary sources such as marine insurance records, logbooks, and business papers. Knowing how to use the registers to get to the information contained in the manuscript collections is an essential part of maritime research. Unfortunately, many of the registers are rare due to the original use for which they were created. They were not meant to be historical documents but, rather, annual records of the vessels that were in existence at that point in time. Once the registers were out of date, they were usually discarded. Luckily, some individuals retained copies year after year, but most did not. 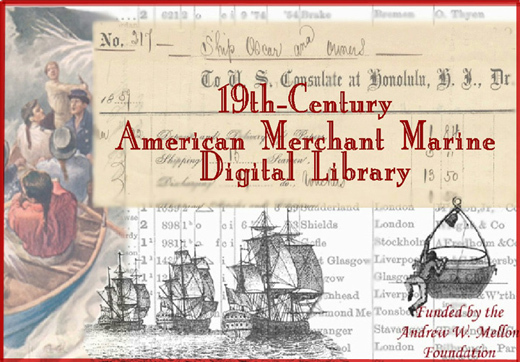 One of the great drawbacks in maritime research today is the fact that no institution holds a complete set of American ship registers for the nineteenth century. With the help of such institutions as The Mariners’ Museum, the Maine Maritime Museum, the Peabody Essex Museum, and the Library of Congress, we have gathered up volumes missing from our collection. Through digital technology and cooperation with our sister institutions, we hope to prevent the loss of vital information, and simultaneously create a complete “virtual” run of nineteenth-century ships registers, beginning with the initial published register in 1857 and continuing through 1900, and make the approximately 50,000 pages of registers available to all. The great advantage of creating the complete run of registers digitally and delivering them via the World Wide Web is that they will be simultaneously available to all of these institutions, as well as to the general public, something not possible in paper or microfilm formats. Researchers and scholars using these collections and registers do employ secondary sources to help put the material in the context of the time. However, the primary documents form the basis of new scholarship. Mystic Seaport’s collections relating to the nineteenth-century American merchant marine have tremendous significance and depth in terms of subject matter, document types, and stories. They span the maritime worlds of shipbuilding, China trade, slave trade, whaling, European trade, port embargoes, etc., and contain all types of shipping documents, legal documents, ships’ logbooks, letters to agents and captains, and personal papers of all sorts. These collections tell thousands of stories and provide abundant raw information for anyone willing to examine them and work with them. These materials have been thoroughly cataloged and in digital form could be put to use immediately. Many secondary sources that are required to fill out the necessary background might be found elsewhere in other libraries. The raw material-the primary documents, registers, and rare books from our collection-cannot be found elsewhere and will make up more than 50,000 pages of images in this digital library. Collections such as the David Gelston Papers are available for the first time to the scholarly community in general. Utilized mainly by maritime historians in the past, these invaluable papers tell a much broader American story than the maritime one alone. Consider that Robert Albion, in his book, The Rise of New York Port, states that the New York Customs House was the principle source of revenue in the Federal Government, and that by 1828 the duties collected there were enough to pay the government’s running expenses, excluding the interest on our national debt. Gelston was the collector between 1801 and 1820 and was originally appointed by Thomas Jefferson. Broad political issues also lie buried within the documents of this collection. The Connecticut vessel L.A. Macomber was lying at anchor off Nantucket shoals on June 17, 1863 when she was captured and destroyed by the Confederate Bark TACONY. At the time of her destruction the MACOMBER had been out fishing for over a week and had on board approximately 2/3 of a cargo of fish. Frederick A. Holmes, an attorney from Mystic River, Connecticut, represented the complainants, i.e., the owners and crew of the vessel, before the ALABAMA Claims Court (circa 1874-1876). This is not the only Civil War-related case in the collection. The merchant marine is represented in other wartime documents as well. Fulwar Skipwith was the U.S. consul-general and commercial agent in Paris, France. He later served as governor of the province of West Florida and in the Louisiana Senate. The papers assembled here pertain to claims against the French Government he made on behalf of shipowners whose vessels were confiscated or destroyed by the French Government during the Quasi-War with France between the years 1798 and 1801. Visit the following link to the National Archives website for further information on French spoliation claims. Buried in our collection of primary materials are thousands of research papers waiting to be written. Making the collections more accessible will hopefully result in wider use and greater publication. Maritime jargon and practices require the researcher to understand nuances and terminology that can be gained only from experience or reference materials. What we are able to offer in this context online are the latter. From Douglas Stein’s American Maritime Documents, 1776-1860 that describes and illustrates documents crucial to the maritime trades, to James Folsom’s Mariners’ Medical Guide that was written “having in view the wants of the mariner at sea,” the works presented here will help to define materials and concepts that are foreign to the uninitiated. Also included in this category are 19th-century marine dictionaries, books on navigation, as well as an 1844 edition of Richard Henry Dana’s Seamen’s Friend a handbook of seamanship and the rights of sailors. The collection of books will continue to grow and will address such aspects of maritime history as commerce, immigration, shipbuilding, whaling and fishing in such a manner that will add to the body of works not readily available from non-specialized collections. It remains a goal to offer books that will continue to illuminate the content of our primary collections.